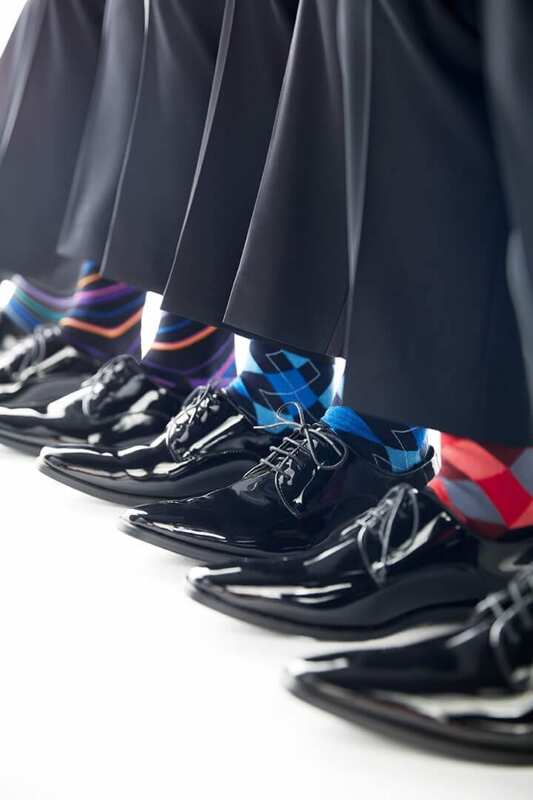 Whether he is waiting at the altar, greeting guests, or taking off the garter, the groom is expected to be dressed to impress. For you special guys out there, I have collected some of the top 2016 wedding fashion trends. I also sought out representatives from national designers Brooks Brothers, Allure Men by Allure Bridals, and Men’s Wearhouse (an exclusive partner of David’s Bridal) to hand-select photos of popular styles. So go get your bride-to-be and let’s research your wardrobe together. Mismatched pieces. “The one colored or plain colored pieces have been replaced with mismatched alternatives like waistcoats for a three-piece style suit in a different color from the trousers and jacket.” The groom also can try a patterned shirt with tweed. Or perhaps either a quirky patterned tie or print bow tie? New colors. 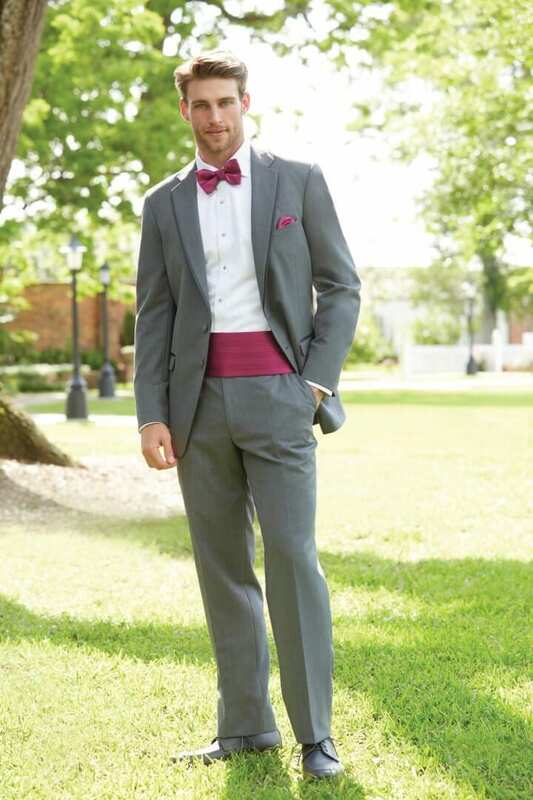 Grooms are choosing marsala, brown, or burgundy for formalwear in lieu of the standard black, navy blue, or gray. According to Fiyin, this can be a patterned mix-up or a one color, two-piece ensemble. Mix and match the crew. 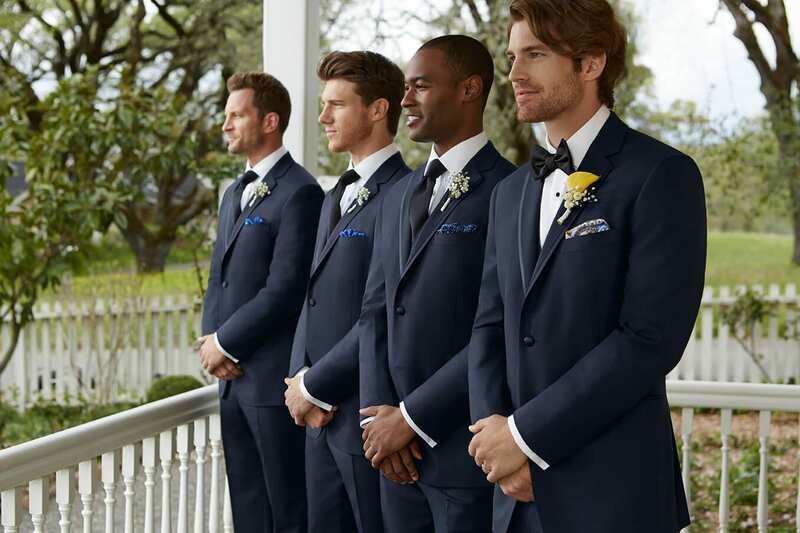 “The stand out groom now chooses a complete or partially different look from his best man and his buddies. We now have grooms that wear a different color suit, or the only one to wear a jacket or even a different vest.” With the mix and match style, the guys can contrast with textures, colors, patterns, and so on. Suspenders for everyone! According to Fiyin, suspenders have made a comeback. The guys can choose patterns or bright colors, or add a personal touch with monograms. 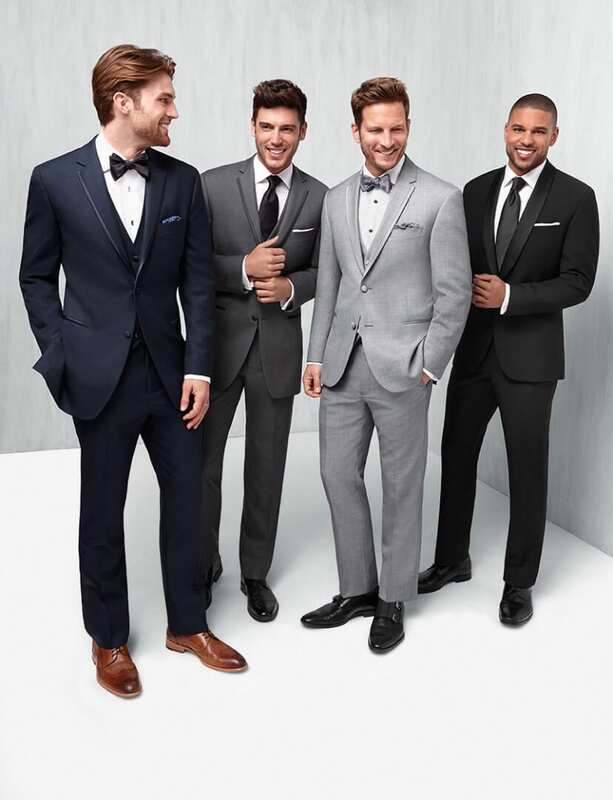 Top styles selected by Men’s Wearhouse. 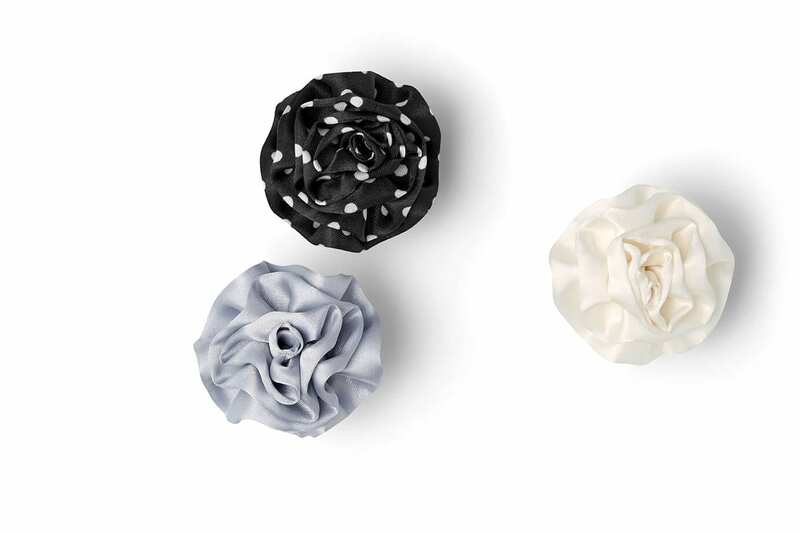 Fabric flower lapel pins are the latest craze, replacing the hassle of traditional flowers. The Joseph Abboud navy tuxedo. The groom makes a statement with his own pocket silk and bow tie. 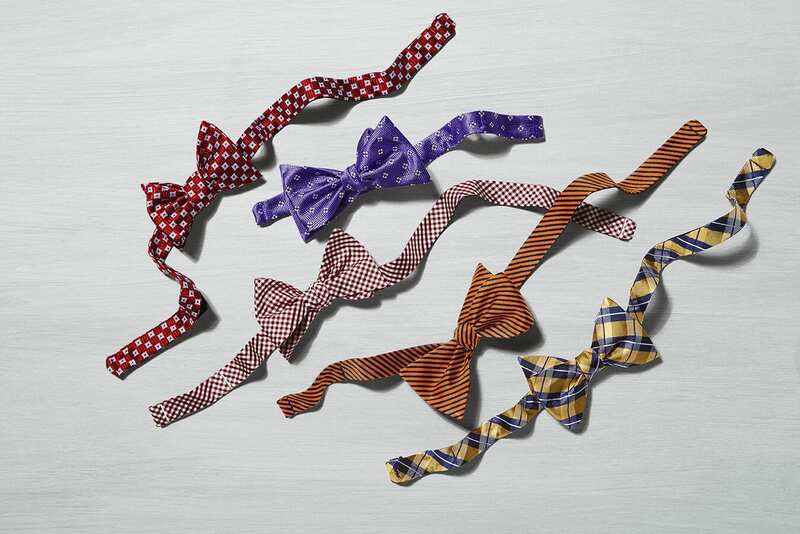 Bow ties from Men’s Wearhouse available in different patterns. In this family shot, the guys mix up shades of gray, along with vests and bow ties. A classic look in navy. 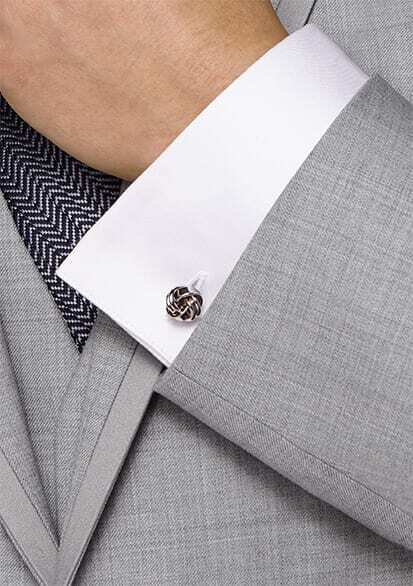 A cufflink completes the look. 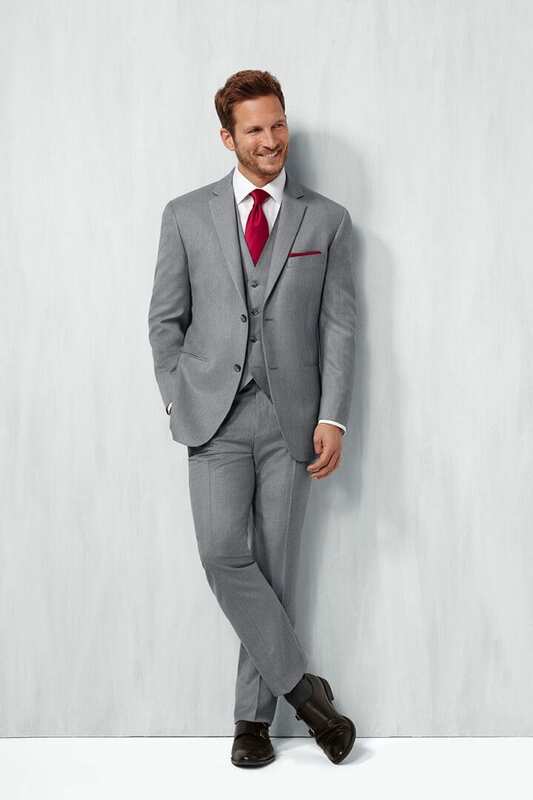 A Pronto Uomo gray suit with pops of red in the tie and pocket silk. 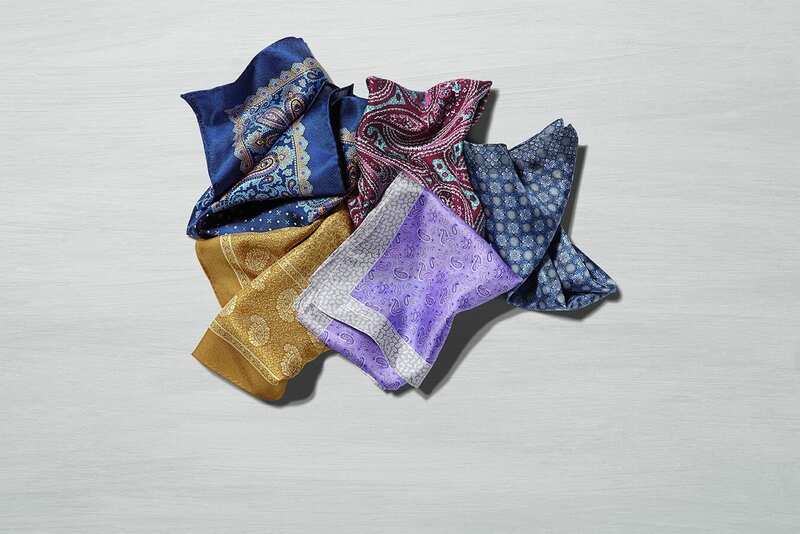 A colorful assortment of pocket silks. The men like to surprise with colorful socks. Studs, a bow tie, and a pocket silk are part of the look. This groom is dressed to the nines. 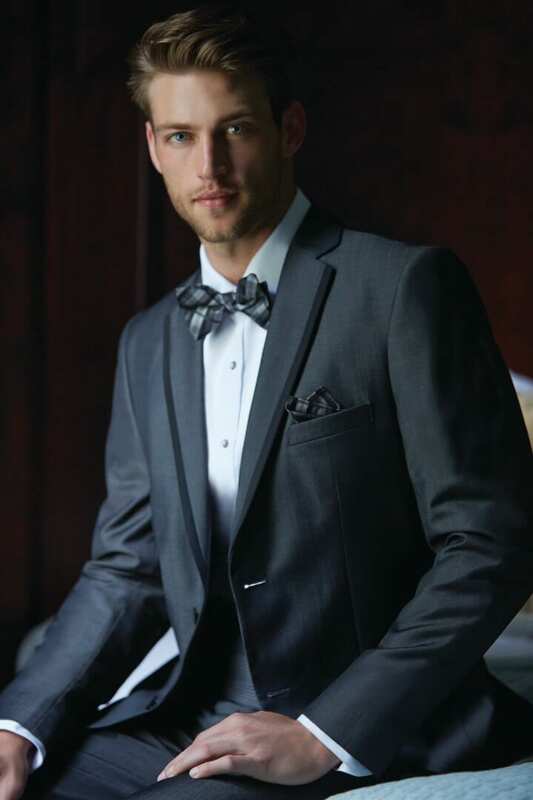 The Tuxedo Shop at Brooks Brothers offers the groom the very best for his special occasion. Dana Schiller offers some of their top picks in formalwear. These are available in New Jersey Brooks Brothers retail locations, as well as online. 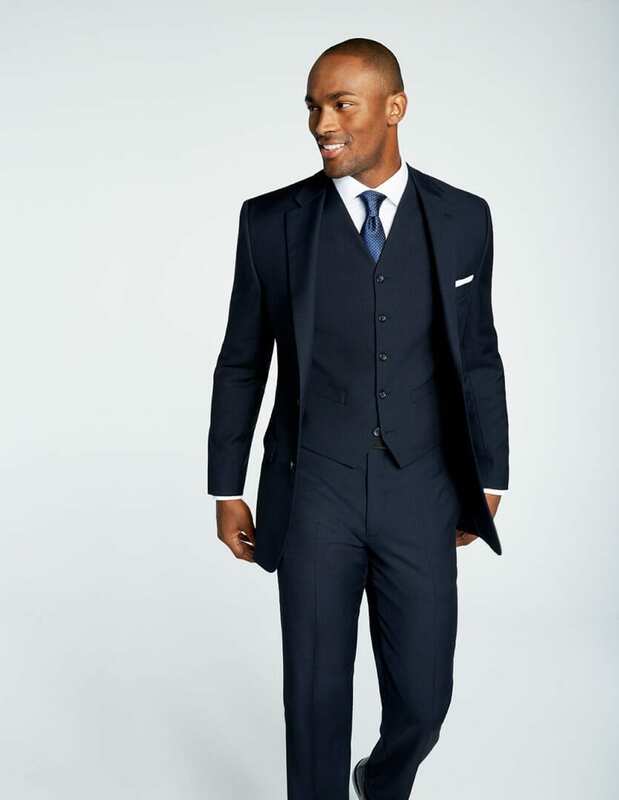 The Brooks Brothers 1818 one-button Fitzgerald navy tuxedo. The double breasted tuxedo jacket by Brooks Brothers. 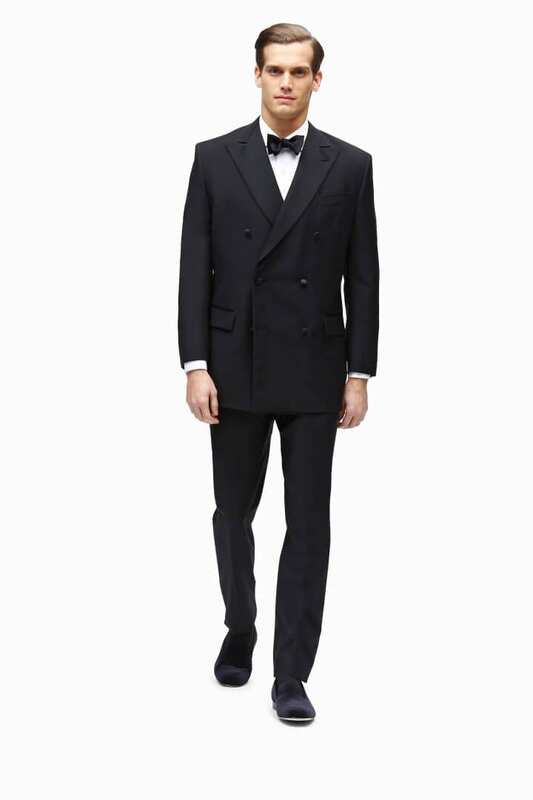 Regent fit one-button peak lapel tuxedo by Brooks Brothers. 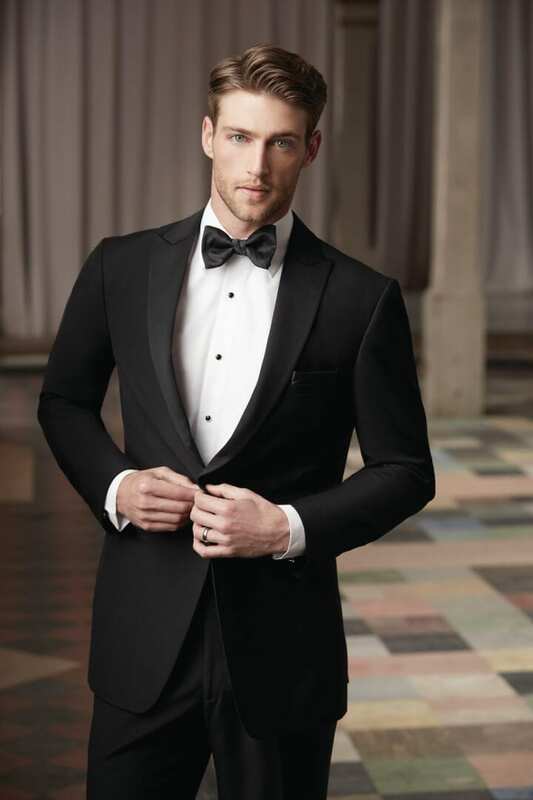 The Brooks Brothers one-button shawl collar tuxedo jacket. Please note that this is not a nested tuxedo. 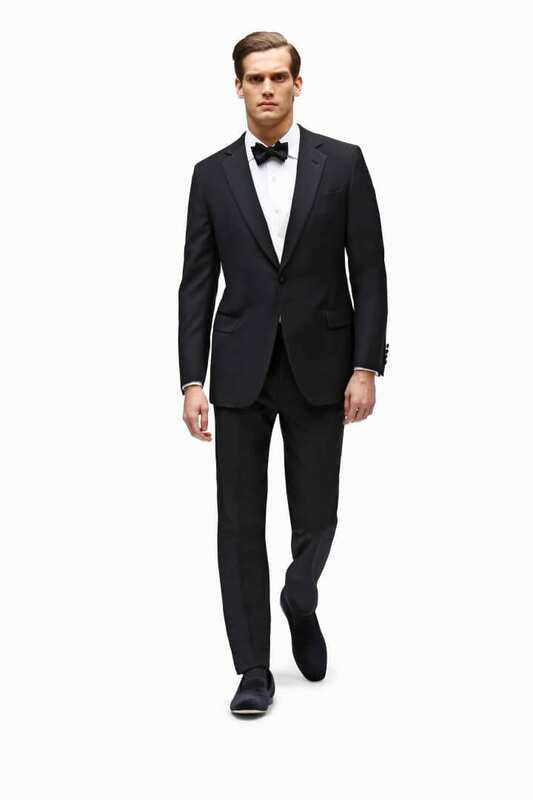 The Golden Fleece Fitzgerald fit notch lapel tuxedo by Brooks Brothers. 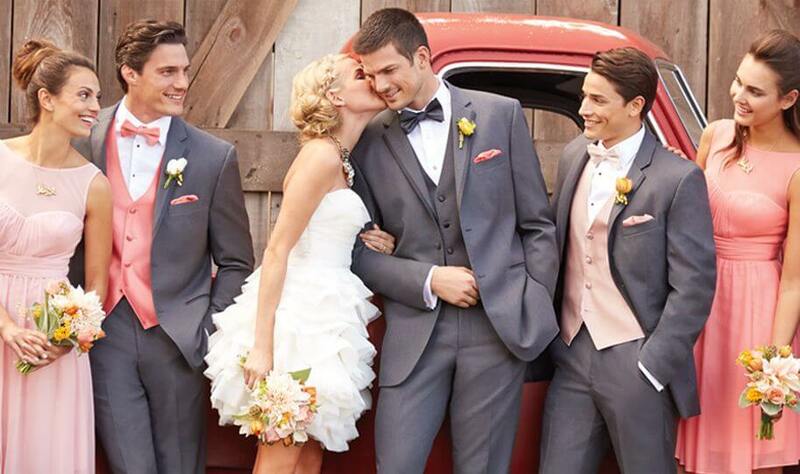 Carley Whitehead at Allure Bridals also selected some top picks for grooms. You can find your nearest Allure Bridals retailer in New Jersey by visiting their website. A close-up of the indigo blue tux. The Allure Men line provides comfort and luxury with an open cut jacket, modern lapel, and slim fit. 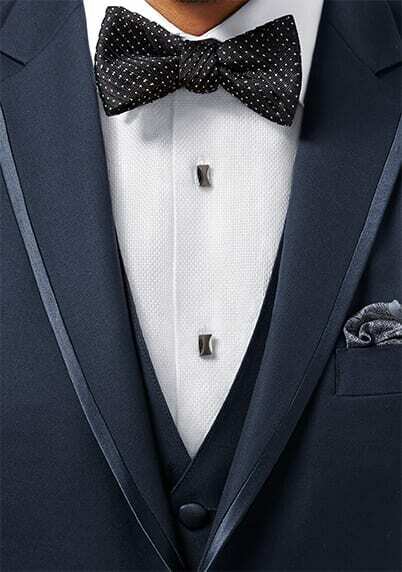 A plaid bow tie and cummerbund accessorize this cement tux with notch lapel. This groom models a style from the Peak evening collection. An evening ensemble by Allure Men with a shawl collar. 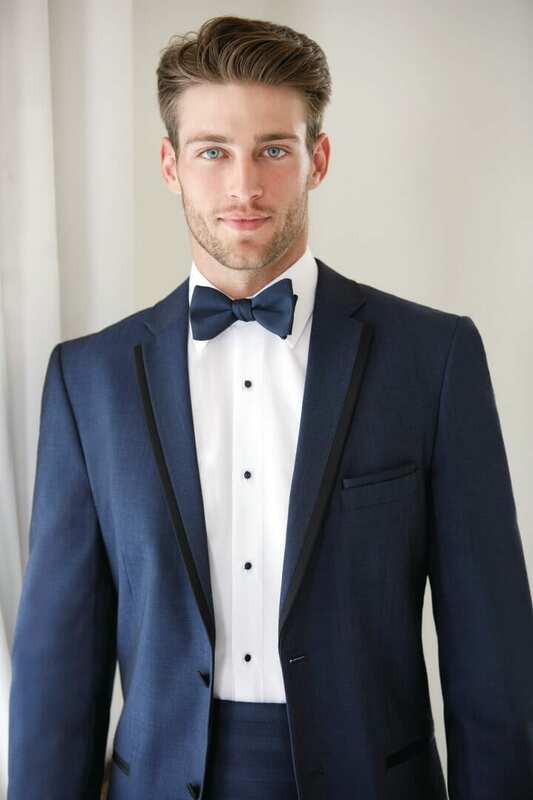 Tuxedos in indigo blue make a striking statement. Another option from the Peak evening collection. 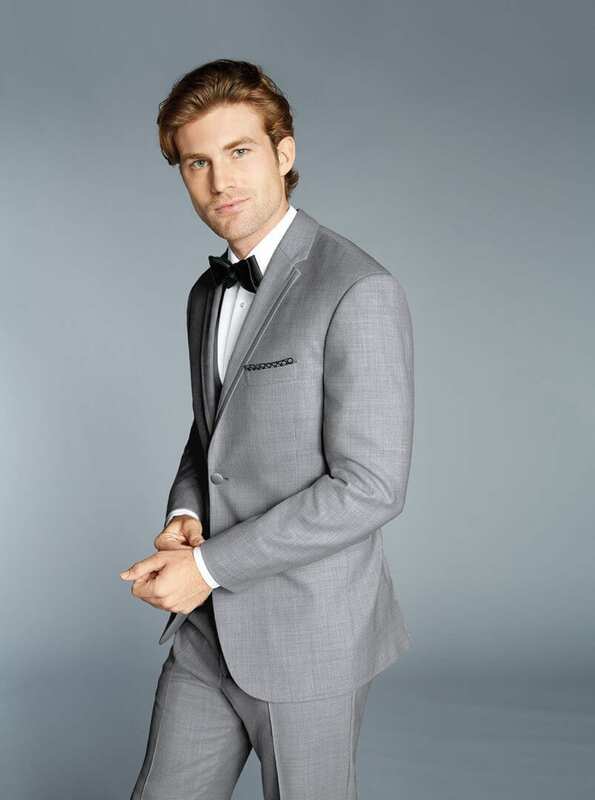 Different coat and trouser options are available for this steel gray suit.